The Golden Puffer has an unusual shape and vibrant iridescent coloring, so looks more like it belongs in a saltwater environment! The Golden Puffer Auriglobus modestus is a freshwater puffer fish that has a sleek body rather than the more club-like appearance of most puffers. Its beautiful iridescent coloration, modulates between golden, green, and bronze hues. This is also an unusual characteristic more commonly seen in marine fish. Fortunately for the freshwater enthusiast it will do fine in pure freshwater. With its variable coloration it can also be found under the common names Bronze Puffer and Avocado Puffer. Puffers are generally known as being aggressive fins nippers and the Golden Puffer or Avocado Puffer is no exception. This puffer is more streamlined and quicker than most other puffer species which can cause problems when choosing tank mates. Fish that are slow or have long fins definitely won't last long in a tank with Golden Puffers. Also, most invertebrates will quickly be attacked or eaten so snails and shrimp cannot be kept with this puffer (but they are great as food!). The Golden Puffer is not a community fish. It is much faster then most puffers and can be extremely aggressive. Constant moving fish like schools of Giant Danios or other danio species are very fast fish, so usually fair pretty well. 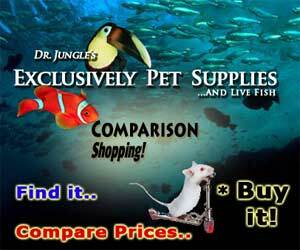 Do not try to introduce long finned slow swimming fish like Angelfish or Gouramis. These fish will be targets for the puffers aggression. These puffer fish do not get very large; usually around 4 inches and do not require a large tank. They do however require large canister filters and weekly water changes. With the proper care and aquarium setup these puffers can live for around ten years and make an interesting addition to your aquarium. The Golden Puffer Auriglobus modestus was described by Bleeker, 1850. (Synonym: Chonerhinos modestus - invalid).They are native to Thailand, Malaysia and Indonesia where they are found in medium and large rivers. These puffers are normally found in swift moving currents, but also can be found in flood estuaries. Other common names it is known by are Avocado Puffer and Bronze Puffer. As with so many of the common names for fishes, there can be a variety of species called the same thing. Consequently there are several other fish associated with the same common names as this fish. The name 'Avocado Puffer' is also associated with the Green Pufferfish Tetraodon fluviatilis and the Ocellated Pufferfish Tetraodon cutcutia . Then there is a very similar looking fish, Xenopterus naritus , that is sometimes called the Bronze Puffer. In the saltwater area there are a couple puffers called 'Golden' or 'Gold' puffers. One is the Guineafowl Puffer Arothron meleagris and occasionally the Dog-faced Puffer or Blackspotted Puffer Arothron nigropunctatus. The Golden Puffer or Avocado Puffer has an unusual shape for a puffer, sporting a sleeker body. 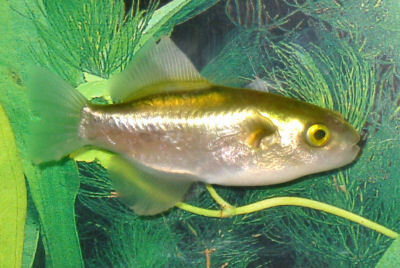 It has an iridescent gold green coloration getting slightly lighter towards the belly. The fins and tail are translucent. These fish can grow up to about 4.5 inches (11cm). Puffer fish have the ability to 'puff' themselves up with water or air if threatened. This apparently helps keep them from being eaten. Another defense of many puffer species is to produce toxic substances in their flesh that is poisonous if eaten. These Bronze Puffer fish can be quite long lived in the aquarium, many living for 10 or more years. Because of the puffers habit of nipping, long-finned slow moving fish are not recommended. Most other fast moving community fish will do fine. Keep in mind that puffers need much more space then typical community fish so the 1 inch a gallon rule does not apply. Amazon Puffers will need 20 gallons per puffer, so keep that in mind when stocking your tank. As with all puffers there is a moderate difficulty associated with owning a Golden Puffer. These fish due to the lack of scales and gill covers are more prone to disease and more sensitive to changing water conditions. The Avocado Puffer fish are aggressive and will not be able to go in a community tank. They need weekly water changes and high output filters. It is common to have to trim their teeth 3-4 times per year which can be an extremely nerve racking job. To do this, add 3 drops of clove oil per liter of water; this will temporarily sedate the puffer so you can hold the puffer in your hand more easily. You will need cuticle clippers; use these to clip bottom and top teeth. Once done put puffer in a container or net that will have the current flowing over them. Once awake release back into tank. The Golden Puffers or Avocado Puffers are omnivores. In their natural environment they will eat shrimps, terrestrial insects, whole fish (only occasionally), and surprisingly enough, seeds. They prefer live or frozen foods such as shrimp, ghost shrimp (gut-loaded), bloodworms, and snails. Sometimes they can be trained to eat freeze dried foods such as krill. Puffers have strong teeth that grow throughout their lives. This Bronze Puffer is prone to overgrown teeth and will need to be offered hard shelled live food often to keep their teeth worn down. Feeding snails and other shelled foods daily will help to wear down the teeth. If the teeth get too long, they will be unable to eat, requiring the owner to clip the teeth. If you do not feed these puffers shelled foods daily expect to trim their teeth 3-4 times per per. Meaty Food: Most of Diet - Feed Live and frozen foods, snails, freeze dried krill, frozen shrimp, bloodworms- live or frozen, gut loaded live ghoast shrimp. Since puffers do not have gill covers or scales, they are thought to be more susceptible to diseases, nitrite, nitrate and ammonia levels. The Golden Puffer is especially sensitive to nitrites and ammonia. Consequently, like all puffers, they are not a good fish to cycle an aquarium with. This puffer fish is a freshwater species and does not require salt. Because they usually don't eat all of their food (messy eaters! ), these fish will usually put more load on the aquarium filtration requiring more frequent water changes and better maintenance in general. A generous weekly water change of 30% to 50% is the standard recommendation for a puffer aquarium. The Golden Puffer doesn't require a large aquarium. But if you want to keep more than one or some other species with them, a well planted 50+ gallon tank is recommended. This will give the other fish plenty of room to escape in case they get chased by the puffer(s). Water Changes: Weekly - Water change should be 30-50% weekly. The Golden Puffer fish requires a tank capacity of at least 20 gallons. As with all puffers Golden Puffer is extremely sensitive to nitrates and ammonia. They have very messy eating habits, therefore, the tank needs large canister filters that turn the tank over 6-10 times per hour. Rotating powerheads are needed to simulate the currents of the rivers they come from. These are very intelligent fish and need a well decorated tank to engage their curiosity. The substrate should be sand as puffers like to root around. There should be driftwood and caves for the Golden puffer to hide. The tank should have floating vegetation to break up the light and offer shelter. Vegetation and hiding places are also essential if housed with other fish who might have to flee from these aggressive fish. Minimum Tank Size: 20 gal (76 L) - The Golden Puffer does not require a large tank for itself, but to keep more than one or some other species with them, a well planted 50+ gallon tank is recommended. Suitable for Nano Tank: Yes - A Nano tank is fine as long as it meets the size requirements and has proper filtration. Brackish: Yes - Although it is a freshwater fish, it will be healthier in slightly brackish conditions. These puffer fish are quick and aggressive so tank mates need to be fast to survive. Community fish will not fair well with the Golden Puffer because of its aggressive nipping behavior. However very fast fish like larger Danios or other danio-like fish would be good choices. The Golden Puffer can be housed with its same species. Other puffers that have reportedly been kept successfully with them as well are the Malabar Puffer or Dwarf Puffer Fish Carinotetraodon travancoricus and the Amazon puffer or South American Pufferfish Carinotetraodon asellus . Do not try to house slow swimming long-finned fish with them, like angelfish or gouramis. Venomous: Yes - Puffer fish harbor toxic substances in their flesh, and the Golden Puffer may be venomous if it is consumed. Peaceful fish (): Monitor - It is a fin-nipper so can only be kept with very fast moving peaceful fish, like larger Danios or other danio-like fishes. Slow Swimmers & Eaters (): Threat - Golden Puffers will nip fins and tails of any slow-moving fish. Shrimps, Crabs, Snails: Threat - is aggressive - These puffer fish feed on benthic organisms in the wild, like shrimps. The Golden Puffer fish has not been bred in captivity. The Golden Puffer does not have gill covers or scales which make it more prone to disease. Puffers are normally the first fish in a tank to show signs of ick and will twitch and rub around the tank. They respond well to most medication and normally heal quickly. NEVER use copper in an Amazon Puffer tank. These Avocado or Bronze Puffers are wild caught and can carry internal parasites, a de-worming should be done if it hasn't been done yet. Heterobothrium Infection is also common, it is an infection of the gills. A Formaldehyde bath can help cure this. For more information about freshwater fish diseases and illnesses, see Aquarium Fish Diseases and Treatments. The Golden Puffer, also called Avocado Puffer or Bronze Puffer, are commonly available from pet stores and online. I have a 10 gallon tank along with 5 goldfish, I've got hiding spots and decor and fake plants. I was at Walmart and saw the litter spotted green puffer. The lady in the fish department gave me very little info on him. She said he eats just flakes, and use the aquarium salt. I bought him and the Jungle aquarium salt. Thankfully I still have a can of blood worms to hold him over besides the flakes until I go buy some other foods/snails for him. Little did I know what I was getting into. What kind of snails would I buy to feed him? I'm going to go buy some real plants for him to nibble on too. Do you think my little guy will survive in my tank? Spotted Puffers (Tetraodon nigroviridis) from Walmart are typically brackish water and will not survive, sadly in your tank. Puffers are referred to as 'aqua dogs' due to their personality, and the fact that they chew on whatever they can. Keep your wires out of reach. They will grow up to 5' and they are semi-aggressive. They really need their own tank and brackish water is not too hard to keep, sort of between salt and fresh. As little juveniles, like many fish, they are found in fresh water, then migrate to estuaries, or brackish water. If it is still young enough to deal with the fresh water, it will go after your goldfish. I would suggest buying another tank for your puffer if you are in love with it, and look up a little more information and your puffer will reward you with years of companionship. They do need to be entertained too! If you don't want to do all of this, then I would say to return the puffer to the store. If you want a TRUE FRESHWATER puffer, they are out there, just do the research before buying, and even then, do not put in with goldfish. Hope that helps and have fun with your spotted aqua dog! They are not gold fish but *GLOfish* their little neon tetra sort of fish and I've been keeping a eye on them and they seem to be getting along. I do plan on getting him a 20gal tank tomorrow just for him. He is quite adorable and I do want to keep him, Hoping he lives and heals because his fins are severely chewed up. I read they are omnivorious and need alot of meat like live crustaceans and freezed bloodworms or shrimp and snails to keep there teeth in check. He's only a inch big right now, would anyone recommend what to feed him till he gets bigger? Mary, those glow fish will be a meal soon. The amazon puffer is a brackish water fish when young then requires full marine conditions when fully grown. Despite what you read online most puffers are salt water fish. In the long run your glow fish will be eaten or killed and the puffer will die from living in the wrong environment. This is what happens when you buy fish from the know nothings at walmart. Please help I just got 2. South American puffers, aka Amazon puffers, are fully FW fish. Spotted Green puffers (the common T. nigorividis) start fresh, but quickly need fairly heavy brackish conditions. I have 2 avocado puffers thier teeth are over grown. I have snails in the tank but they won't eat them. How do I clip thier teeth? can avocado puffers live in brackish water and if they do how high should the gravity be?? No please don't make the fish suffer. It's freshwater only. Actually, it needs a GRAVITY of 1.005-1.008 but CAN surrvive in a FRESH WATER aquarium.